There was plenty of interest to see what changes the Coldstream Men's Shed have made to the interior of the town's Rodger Hall. Coldstream Men’s Shed has moved into its new home in the Rodger Hall and its official opening ceremony was held last week. 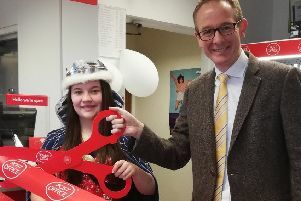 Berwickshire Deputy Lieutenant Andrew Douglas-Home did the honours and cut the ribbon, declaring the premises open, following an introduction by Coldstream resident and Berwickshire, Roxburgh and Selkirk MP John Lamont. In November 2016 Scottish Conservative party leader Ruth Davidson opened the Coldstream Men’s Shed’s original meeting place at shop premises on the town’s High Street. Shop owner Jock Law was instrumental in setting up the group which now boasts over 50 members and it soon became clear that they were going to need bigger and more permanent premises. The Scottish Borders Council owned Rodger Hall in Coldstream’s Victoria Street had been mothballed and Coldstream Men’s Shed started negotiations with the council in June last year over an asset transfer of the Hall. That has now gone ahead and in recent months the men have been busy transforming the space into a workshop and meeting place, the envy of many a Men’s Shed group.